The short squeeze of the last two weeks finally appears to have run out of steam with the 40 day moving average proving to be the catalyst for the reversal with yesterday’s high failing to breach this key indicator. 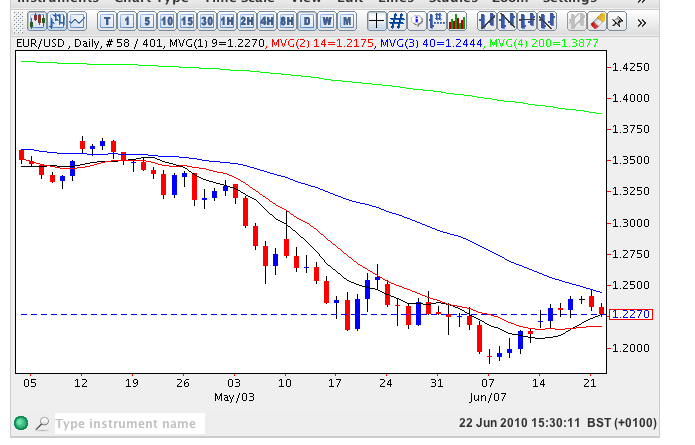 Today’s price action has seen the euro vs dollar fall back to trade in the USD1.23 price area confined to a narrow range, and now sandwiched between the longer term moving averages to the upside and the shorter term averages to the downside. For a continuation of the longer term bearish trend we need to see a break and below USD1.21 which would then re-establish this pattern and should result in a re-test of USD1.18 thereafter. With the price entangled in the various moving averages trading this pair will be tricky for the next few days until there is a definite move one way or another. Fundamental news has centred on the German Ifo which came in marginally better than expected at 101.8 against a target of 101.2 – good news that was entirely discounted due to the market’s overall negative sentiment towards the euro at present. Meanwhile in the US sees the existing home sales which are forecast to show an improvement over last month and, of course, sees the FOMC interest rate decision which given the market’s focus on employment & debt is unlikely to have any impact whatsoever.